Nearly a year after hosting America’s Cup, Bermuda finds its sea legs as a rediscovered playground for the wealthy—especially those with a penchant for sailing. 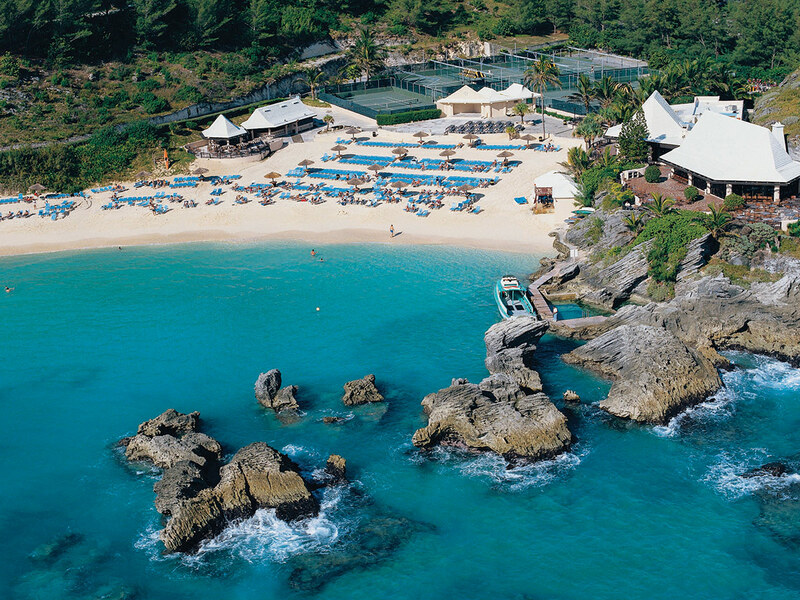 The private beach club enjoyed by Fairmont Southampton guests. Before the first fish chowder had been ladled, before long pink shorts had been bought and before the onslaught of Dark and Stormy cocktails on the beach, there was the congeniality of our seventh-generation Bermudian driver, John. On the short route from the tiny airport to the Fairmont Southampton (room rates from $375 per night) on the other side of the island, John lled us in on the unique architecture of the locals’ roofs (they are usually white and grooved to collect fresh rainwater for its residents inside); their cultural obsession with fried sh sandwiches on raisin bread; and pointed out where Ross Perot, Silvio Berlusconi and Michael Bloomberg all have mansions. John’s family has been here so long that his great-great-great-greatgrandfather came from Portugal on a ship in the 1700s to help build some of the country’s earliest infrastructure. His wife is also Portuguese, but his mother is British, so he goes back to England to visit family quite often. His accent also vaguely sounds Australian or from New Zealand (citizens of both ock here in droves), so he is the perfect representation of the hodgepodge of cultures that convene to make up this bright and cheerful island nation. Bermuda, a sliver of a sea-hook-shaped island in the Atlantic Ocean, is only 665 miles off the coast of North Carolina. Almost everyone thinks it’s in the Caribbean, but, although it’s only a two-hour ight from most East Coast cities and shares their weather (yes, it can be chilly at night here), it couldn’t feel farther from the States. Svelte locals bicycle the narrow streets, drive on the other side of the road, discuss the prime minister and Parliament in beachside shacks and are consumed with sailing. Almost every Olympic and professional sailing team has spent time training in Bermuda. This year, March 25 to April 1, the country hosts the Moth Worlds; then April 28 to May 4, it will put on Bermuda International Invitational Race Week. Plus, there are three more large regattas and rallies in May, then two in June, and, nally, July 8 is the Atlantic Anniversary Regatta: Bermuda to Hamburg event. 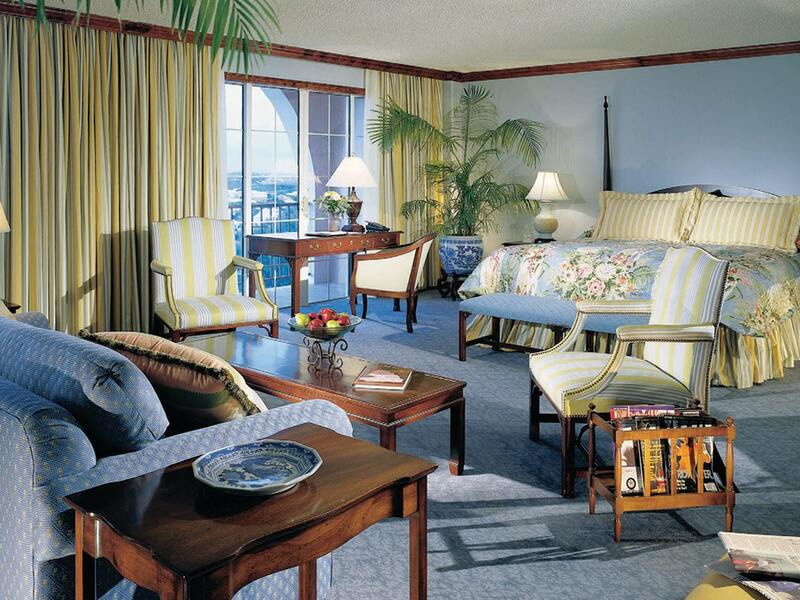 One of the two 2,900-squarefeet Fairmont Gold Penthouse Suites at Fairmont Southampton. Like a lot of Bermudians, John loves sailing too... and Rum Swizzles. It’s Bermuda’s signature drink, and he says our hotel’s private bar, The Rum Cellar (a discrete and hard-to-find seasonal pop-up bar that attracts celebrities and athletes), is the perfect place to try our first. As he winds up, up, up through almost 100 acres of lush property to drop us o at the enormous pink hotel that sits on the island’s highest point, we say goodbye and are greeted by lanky men in shorts and tall socks who take our bags to the suite. The four-diamond Fairmont Southampton has nine restaurants, 593 guest rooms, two pools, an 18- hole championship golf course and is quite expansive in general. There are happy guests everywhere who venture down the hill every few minutes to the hotel’s private beach club, which sits in a secluded cove on a quiet bay. This is not the kind of hotel where you go to escape; it’s a place to make new friends and engage in interesting conversation in the bars and common areas. Although it’s a drive to the other side of the island, we are foodies at heart and are thrilled to make the trek to try the newly opened Marcus’, a concept by chef Marcus Samuelsson, inside our hotel’s sister property, Hamilton Princess & Beach Club (room rates from $459 per night). This grande dame opened in 1885 and is one of the most famous hotels in the country, as well as one of Fairmont’s oldest properties in its portfolio. With more than 400 rooms, the waterside property underwent a $100 million overhaul two years ago. Part of that renovation included Samuelsson’s resto—a mix of the famed chef’s signature dishes (chicken and waes) with traditional takes on Bermudian food (grilled Bermuda onion, jerk cauliower and sh chowder bites are must-haves). The bright space sits on a private marina, and three sides of the dining room have ridiculous floor-to-ceiling views of the bay. Pop and modern art punctuate the hallways around the restaurant, as well as throughout the hotel and its grounds. Works by Andy Warhol, Yayoi Kusama and Je Koons pepper the lobby, and don’t be surprised to see a Damien Hirst or Ai Weiwei piece on your way to the powder room. Beyond Marcus’ is a marina filled with handsome catamarans and yachts. Sailors on the water pass by on their way to secret coves to drop anchor or tie up to the private docks of those lucky enough to call this place home. People like John. The boats drift into the horizon as I hear two jolly, boisterous locals at the bar comparing their skis. One loudly proclaims his own 51-foot Morgan sailboat is out in the marina and how it has “plenty of canvas to make headway even in the slightest breeze.” I chuckle at the charming nature of their prideful boasting, which perfectly captures the spirit of Bermuda... and then I notice they both take a sip from their matching Rum Swizzles.